Buy Biona Organic Honey Waffles in the UK from our online shop or directly from our independent Scottish store. These deliciously crunchy wholegrain waffles are filled with sweet organic honey. Perfect for crunching, dunking, or snacking on the go. Try this Dutch method for eating 'stroopwafels': Put your waffle on top of a hot drink (tea, coffee, hot chocolate), leave for one minute and enjoy the now slightly warm waffle! Wheat Syrup*, whole wheat flour*, palm oil*(from sustainable source), honey* 8%, corn malt syrup*, soya flour*, raising agent: sodium bicarbonate, emulsifier: sunflower lecithin, cinnamon*, sea salt. Contains gluten, soya and may contain traces of nuts and milk. As official Biona stockist, we sell genuine Sweet Biscuits directly from our shop in Scotland and online throughout the UK. Where can you buy real Biona Honey Waffles safely online? If you are wondering where you can buy Biona Organic Honey Waffles safely online in the UK, then shop with us. We are an actual health foods shop; with real people selling real foods and products. Our award-winning independent shop is located in Stirling, Scotland since 1976. You can buy our Organic foods suitable for vegetarians and other genuine Sweet Biscuits in store or safely place an order with us online or over the phone. 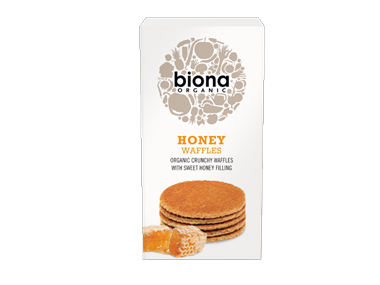 Biona Honey Waffles - Biona Organic Honey Waffles in Sweet Biscuits and Biscuits & Breads.